Want to have an author visit? 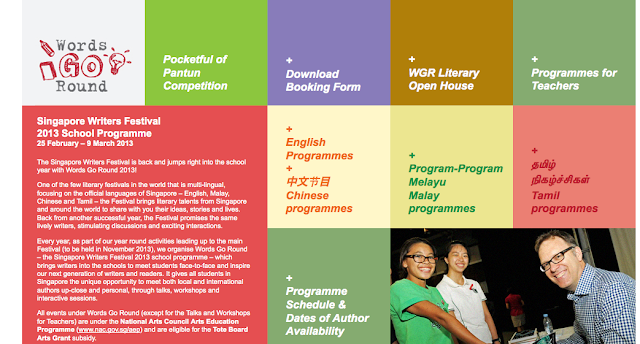 The Singapore Writers Festival -- Words Go Round -- is an annual event which brings authors into schools. Very cost-effective. Last year we had James Roy, Jack Heath, and Garth Nix. This year we are going for John Boyne, Minfong Ho, etc. Go to the website for more information. But act quickly - the schedule fills up. The one-day "Texts Worth Teaching: East Asia" conference at UWCSEA East on Saturday, January 19th -- featuring Dr. Kirpal Singh, Robert Yeo, & Holly Thompson. The "SAS Children's Literature Conference" on February 1 - 3, at the Singapore American School -- featuring Chris Crutcher, Kadir Nelson, Laura Vaccaro Seeger, and Deborah Wiles. So hope you all have managed to get copies of the 2012-2013 Red Dot books on your shelves. Do have a look at the GoodRead Groups for each category if you haven't already. If your students want to interact with others, exchanging reviews and comments, they are they way. By the way, a new TED talk just got posted -- by Jarrett Krosoczka, the author of last year's Younger Readers Red Dot Book choice -- Lunch Lady and the Cyborg Substitute. It's an incredibly moving account of how he became an artist -- and why art meant so much to him, given his start in life. Adults will appreciate it more (i.e., don't start playing it for students unless you want them to hear about how his mother was a heroin addict and incarcerated), but upper primary students might get a lot out of it. I'm glad we contributed to his success in some small way. At the last meeting we'd announced that an IB Job-Alike would occur on the Friday of the weekend of the IB Librarian Continuum Workshop, being held at Tanglin January 18-20. The plan was that the workshop would finish about 4pm and the Job-Alike would start at 4:30pm, giving us a perfect combination of network+outside people for a professional & social event. Unfortunately, the IBO arranged their own Friday post-workshop entertainment -- a storyteller from the Singapore Storytelling Association -- for all workshop participants (librarian & otherwise). So..... Jacqui Makselon has offered to host the re-scheduled IB Job-Alike on February 20th. It will be at 4:00pm for a 4:30pm start, at Tanglin, in the Senior Library. Put it in your calendar!